I have been reading news reports about the shootings in Colorado. The story is so tragic and the violence seems so unspeakable. The interesting side story is the gun culture in America and the binary way in which people of America speak about guns and their second amendment rights. The rhetoric that has been ramped up in just a few short days is phenomenal. What seems so bizarre to me is the fact that so many will come to the defence of the notion that the Founding Fathers of the United States intended for the American citizen to have access to unlimited assault weapons that should be able to be legally accumulated. Some of the families of victims of this tragedy are also offended by any conversation about legislation to control the proliferation of assault weaponry. Use the words gun control in America and you have opened a whole can of worms. Ironically many who speak the loudest are followers of Jesus. I find that to be very surprising. It is shocking to me to read about how easy it is to acquire enough weaponry to wage a small war. The Christian outlook on this of course has less to do with self-defense and more to do with the defense of the other person. Jesus asks us to love our enemies, not to murder them; to pray for them, not to take vengeance; and he commends the peacemakers among us, not those advocating for more and more and more weapons. Was Jesus naïve? I wonder about that. I often marvel how some Christians can say that in one breath, and proclaim him as the Son of God in the next. Apparently, some believe that the Second Person of the Trinity didn’t know what he was talking about. But Jesus lived in a violent time himself, under the heel of Roman rule in an occupied land, when human life was seen as cheap. Jesus witnessed violence and was himself the victim of violence—the most famous person to suffer the death penalty. It was not only divine inspiration but also human experience that led him to say: Blessed are the peacemakers. We as a Christian people follow a non-violent leader and as such we are called to speak up for the victims of violence. Fr Martin makes the point that those who would speak up for those whose lives are being threatened in any other way should be speaking up for tighter gun laws. Farmers and sportsmen need not worry about this. Most moose hunters I know are not headed into the country with AR-15 military-style assault rifles to mow down their targets. I cannot for the life of me figure out how a young man in an urban setting can purchase military equipment and have it delivered to his apartment. I am also baffled how Christians can advocate for the ‘freedom’ to own that kind of weaponry. I am praying for the victims, for the people of the city of Aurora, the first responders, the perpetrator of this violence, and for Churches across America that they might find a voice to stand up for non-violence and stand up for a more peaceful way. All I can think to do is what we’ve always done. 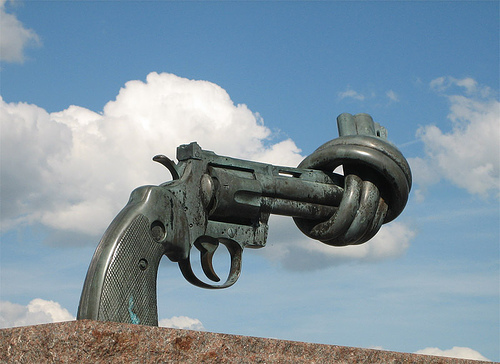 We work towards peace and non-violence. We register voters. We create art and music in the face of madness. We light candles. The praying people pray: Lord have mercy. The meditating people meditate. We create Love and beauty as radical acts We take care of the poor, and teach people to read and write. And as Molly Ivins would urge us to do if she were still here, we bang our pans. We rise up, peacefully, take to the streets and we bang our pans and we make a ruckus, and we stop this war, too. Blessings my brothers and sisters, yes the real church that is you, and especially me have to be out there on the streets.,Out in the church of the world, not in the small church buildings of the establishment. No war was won without footsoldiers on the ground. The military know this, we must learn this too. Christ did not die on a silver cross on an altar between two candle sticks, but on the rubbish tip between two thieves. Please excuse my barging into your post with my commens. I have found the correct space for my comments and not the “reply” option I used. I know that when I have judgmental thoughts and comments about Holmes and Loughner I am not exercising my Christian faith. It is very difficult to be a Christian in thought, word and deed. But I keep trying……Thanks again for your post. As Mr. Cohen says – everything is cracked so the light can get in. These shootings in Colorado have created a jagged gaping chasm – we must find ways that the Light can flood in and sweep away the darkness.